A longtime Eva’s Village volunteer Nora Renzulli received the 2015 New Jersey State Governor’s Jefferson Awards for outstanding community service. Renzulli was recognized in the BD Paterson Patriot category becoming one of almost two dozen honorees for the 2015 New Jersey State Governor’s Jefferson Awards. The BD Paterson NJ Patriot award recognizes individuals whose public service or volunteerism advances standard and quality of life in the city and is sponsored by Franklin Lakes-based medical technology company BD (Becton, Dickinson and Company). Renzulli visited the Eva’s kitchen some 13 years ago and from then on she’s been volunteering at New Jersey’s largest anti-poverty organization. Renzulli and other volunteers make it possible for the Eva’s community kitchen to serve 300-400 guests every day with a hot meal. 22 people and organizations were honored in the 2015 awards. The volunteers will recognized at the New Jersey Sate Governor’s Jefferson Awards Gala at the Newark Museum on June 8. A select number of the honorees will travel to Washington D.C. to represent New Jersey at the National Jefferson Awards. “In addition to volunteering every Friday, Nora and her entire family have made a family tradition of serving in our Community Kitchen every Christmas,” Reger said. 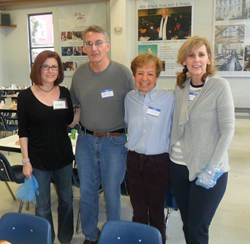 Nora Renzulli (right) pictured with a group of Friday volunteers at the Eva’s Village Community Kitchen.